Team Lea’s second batch of artists to go through the Live Shows will need either their coach’s approval or enough votes on January 31, 2015. The voting lines will be open once more giving the power to the viewers to save their favorite artist. 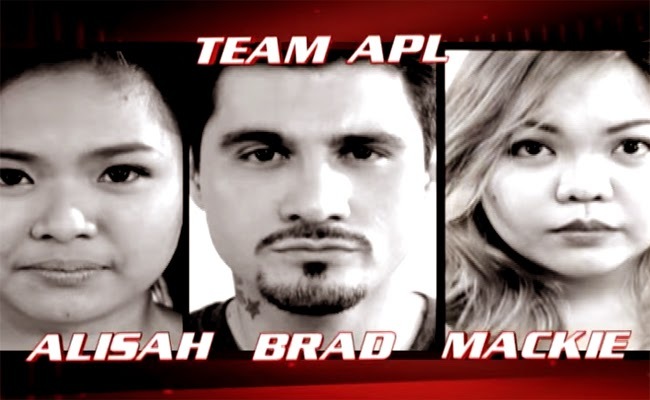 Team Apl’ second batch Alisah, Bradley and Mackie gets into the gear to try their best to secure one of the two spots left available. Mackie, the ultimate biritera sung ‘Making Love out of Nothing at All’. Apl asked her to make the audience be in awe. After joining various singing contests, Mackie shares that this is one contest she is determined the most to win. With her strong vocals and dressed in blue, Mackie tries to keep her presence felt in the Resorts World Manila. Sarah said that she did well in her performance. She was able to feel the story of the song. Apl said that her seriousness had been felt in her song. Bradley sung ‘You Gave Love a Bad Name’. Apl said that he wanted his to be grand and to show the same showmanship he was able see in the Blinds Audition. Apl seemed to enjoy himself during Brad’s performance. Lea shared that Brad did one of the sexiest performance on stage. Apl said that Brad’s talent is rare added with confidence and personality. Alisah sung ‘Bituin na Walang Ningning’ to share her life story. She was a vendor and now she works hard to reach for her dream to be an artist. Bamboo said that she did a great job. Apl shared that her talent had leveled up. He said that her mom must be proud of her. The voting lines are once again open for the viewers to secure the spot on the next round of the competition. Who among Alisah, Bradley and Mackie will be continuing as contenders of The Voice of the Philippines?